This new nail trend is peak summer. 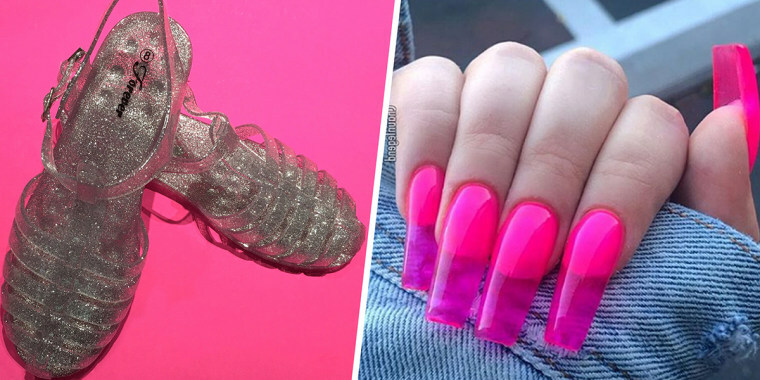 If summer makes you miss those glittery, translucent jelly shoes from your childhood, you will absolutely love this new manicure trend. Jelly nails are now a thing that are not only taking Instagram by storm, but winning over our hearts. The translucent nail trend features bright (sometimes neon!) colors and, if you're lucky, glitter. Lots of it. Can't get enough of nail trends? Check out our A-to-Z nail "GIF"-tionary of the trends to know now. Even Kylie Jenner is in on the trend, posting an Instagram photo with the caption, "Feelin girly," and wearing the color of season: lavender. Heather Sanders, who owns trendy Los Angeles boutique Sorella, also posted a picture wearing the trend. She added a Nike swoosh to her pinky finger for additional flair. If you like the trend but need it to be a little more subtle, there are options for you, too! This look is still perfectly polished, but with slightly muted colors. If your motto is "more is more," these nails will definitely float your boat. This nail artist also refers to them as glass nails ... whether that's due to their sharp edges or because they're translucent, we may never know. This Los Angeles-based nail artist perfectly nailed those colors — they look like beach balls! Whether this trend is a passing fad or here to stay, it's definitely the perfect summer look!